Personal Hygiene Options for people on the Go! Through ongoing market research and in-depth studies, we at SANiT S.A. have identified the need to improve the personal hygiene options for “for people on the go” who out of necessity have to make use of public toilet and washroom facilities. The pack has been designed for travellers, campers or sportsmen and women to carry in their hand luggage, overnight bag, sports bag or in the glove box of their vehicles so that it is close at hand when the need arises to make use of public toilets and washroom facilities. This pack has been designed for travellers to carry in their hand luggage, overnight bag or in the glove box of their vehicles so that it is close at hand when the need arises to make use of public toilets and washroom facilities. Sanit Air Fresh’ner is a high quality air freshener. Toilet odours are caused by germs, bacteria and human excretion and can make any visit to a public or domestic toilet an unpleasant experience. Public toilets would include toilets in aeroplanes, busses, coaches & trains, restaurants, offices, shops, schools and day care centres, rest rooms on our major highways, gyms and sports clubs and yes, even in our friends’ homes. Sanit Surface Sanitizer is a high quality surface sanitizer and disinfectant. Because of the high levels of germs, bacteria and human excretion soiling found in public toilet and bathroom facilities it has become a necessity to clean and disinfect toilets prior to using them in almost all public areas. These places would include aeroplanes, busses, coaches & trains, restaurants, offices, shops, schools and day care centres, rest rooms on our major highways, gyms and sports clubs and yes, even in our friends’ homes. Sanit Liquid Hygiene Hand Soap is a high quality, unisex fragranced, moisturizing hand soap. Simply dispense the soap directly onto your hands and rub together thoroughly with clean running water to create foam. By rubbing your hands together the soiling on your hands will be loosened where after the loose dirt and soap can be rinsed off with clean running water. Sanit Hand Sanitizer is a high quality gel hand sanitizer and disinfectant. Because of the high levels of germs and bacteria, which are found on most surfaces, which one comes into daily contact with, it has become necessary to sanitize ones hands regularly during the day. Germs and bacteria are being deposited on toilet and restroom door handles, toilet flusher handles, taps, and paper towel dispensers, including hot air blow dryers which make ideal homes for most germs! Sanit Hand Lotion is a high quality non greasy moisturizing lotion with a light vanilla fragrance. It penetrates the skin quickly leaving your hands properly moisturized yet not oily, meaning that you can immediately continue with your daily tasks without having items slipping out of your hands. Simply dispense Sanit Hand Lotion directly onto your hands and rub in thoroughly for protection against dry skin caused by cold winter weather and excessive washing with certain hand soaps. 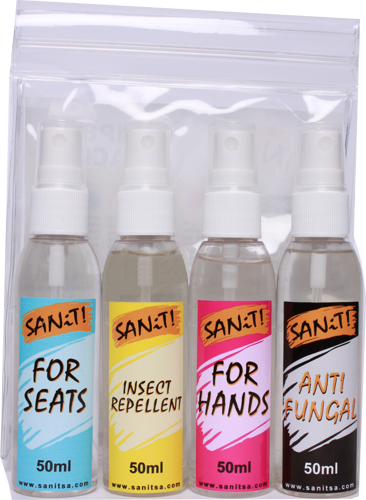 Sanit Insect Repellent is a high quality insect repellent which has been developed to repel most insects including fleas, flies, mosquitoes and hair lice. It is an easy to use body spray which efficiently creates an effective barrier on the skin to repel most insects. Simply spray Sanit Insect Repellent directly onto the skin for a long lasting protection. Sanit Insect Repellent Body Lotion is a high quality non greasy moisturizing body lotion which has been developed to repel most insects including fleas, flies, mosquitoes and hair lice. It is an easy to use body lotion which efficiently creates an effective barrier on the skin to repel most insects. Simply dispense Sanit Insect Repellent Body Lotion directly onto the skin and rub in thoroughly for a long lasting protection. Sanit Anti-Fungal Spray is a high quality fungal spore eliminator and shoe freshener. Fungal spores are the cause of athlete’s foot. They lurk in most bathroom, shower and washroom facilities and easily lodge themselves in warm moist places such as in between the toes and under the toenails. Although these facilities may be cleaned or seem to have been cleaned regularly, if they have not been sanitized properly you will be at risk of infection. Sanit Computer Sanitizer & Cleanser is a high quality sanitizer and cleanser for use on computer screens, keyboards, computer mice and telephones. Because of the high levels of germs and bacteria which are transferred by human touch, sneezing and coughing, most computers and telephones carry high volumes of germs and bacteria. Studies have shown that about 50% of toilet users do not wash their hands before exiting a toilet or washroom facility. This is a micro fiber cloth and measures 40cm x 40cm. 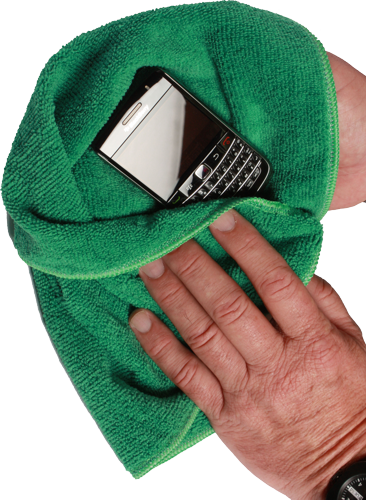 It has Anti-Static properties and successfully removes dust from computer and television screens, casings and accessories. © 2009-2019 SANiT SA. All Rights Reserved.